"Create a Father's Day golf gift that will make dad say - WOW!" Once again you find yourself searching for that perfect Father’s Day golf gift. Those golf balls you bought last year were not the ones Dad actually uses. And Grandpa never did wear that nice golf hat you bought. Your impossible search for the perfect golf gift continues for another year. But this year things will be different. 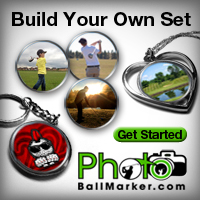 Instead of looking for that perfect gift, with the help of PhotoBallMarker.com, you decide to make it yourself. As Father's Day approaches, PhotoBallMarker.com has that perfect Father's Day golf gift for Dad or Grandpa. That gift is a custom set of five photo ball markers accessorized with a magnetic hat clip, divot tool or key chain. PhotoBallMarker.com makes creating custom golf ball markers from your photos very easy, fun and affordable. 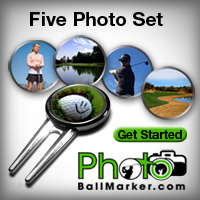 Simply visit PhotoBallMarker.com and click the “Special Five Photo Set” option. 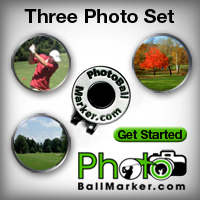 You are taken to the Order Screen where you upload and edit five pictures to be manufactured into your ball markers. Next, select a ball marker holder (hat clip, divot tool, or key chain) and enter your name, email and address information. Make payment of $34.95+$4.95s/h and in 5-7 days the epoxy-domed photo ball markers arrive via first class mail. After Dad or Grandpa opens his amazing Father’s Day gift, do not be surprised if he tells you he wants this same gift next year. Many times Dad or Grandpa will request or even demand new ones for the next holiday. This sure makes creating Dad’s or Grandpa’s next holiday gift a whole lot easier. Father’s Day is a very special day and finding that unique and affordable golf gift can be very challenging. Five special photo ball markers just might be the gift you are looking for. Use of this material is granted and appreciated. Last Updated: May 14, 2015.